The local Non-profit group, Tiburon/Belvedere Residents United to Support the Trails (TRUST), seeks a court judgment protecting historic trails on the Martha property in response to recent closures and vandalism. See information on the press release – click here. See a map of the Martha property – click here. See a more historical perspective – click here. Belvedere Tiburon, CA – On August 31, 2017, Tiburon/Belvedere Residents United to Support the Trails [TRUST] filed a quiet title action in the Marin County Superior Court asking the Court to find that a public easement exists over the network of trails traversing the Martha Property on the Tiburon Ridge. The Martha Property is a privately-owned parcel of land adjacent to Old St. Hilary’s Open Space Area on the southern tip of the Tiburon peninsula. The 110-acre property contains over two miles of trails that have been used by the public for generations, including the Ridge Trail and the historic Spanish Trail. For over 50 years, locals and visitors from around the world have openly walked, biked, trekked, hiked, jogged, run, picnicked, engaged in horseback riding, and generally enjoyed the trails and open space areas on the Martha Property and adjacent open space areas. This has been a benefit and a boon to the community. In recent months, the public has been denied access to these trails and surrounding areas have been damaged. TRUST’s lawsuit seeks to protect the trails on the Martha Property, and the longstanding right of public access that was legally established nearly 50 years ago by virtue of the public’s open, regular, continuous, varied, and substantial use of the trails and surrounding areas. This lawsuit is the direct result of the blockages and attempted closures of the public trails, as well as acts of vandalism to surrounding areas and natural monuments. Such acts include the placement of steel barriers, barbed fences, stakes, and signs on and about the trails and natural landmarks on the Property. 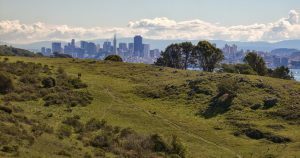 For example, the Ridge Trail and the historic Spanish Trail have been closed, and “Founder’s Rock,” a geological formation and popular gathering spot overlooking Angel Island State Park, has been irreparably damaged. TRUST is the Plaintiff in this case, brought on behalf of the public. Defendants include the Martha Company, owners of the Martha Property, and unnamed DOES One through Fifty. TRUST is a community-based nonprofit association dedicated to protecting the public trails and open space areas on the Tiburon Ridge in Tiburon, California. TRUST works to protect, preserve, and promote public access to and use of trails and open space through advocacy, conservation, and community engagement. TRUST believes that publicly accessible trails and open space areas contribute to the well-being of individuals, the health of ecosystems, the resilience of communities, and the welfare of the planet. TRUST is a fiscally sponsored project of MarinLink, a California nonprofit corporation exempt from federal tax under section 501(c)(3) of the Internal Revenue Service #20-0879422. If you would like more information about this topic, please contact William M. Lukens at (415) 433-3000 or email at wlukens@lukenslaw.com. Any donation may qualify as a charitable deduction for Federal tax purposes, but please consult with your tax advisor or the IRS. We are able to take contributions of stocks. Please contact our treasurer at email address tiburontrails@gmail.com and put the phrase STOCK CONTRIBUTION in the subject of the email.